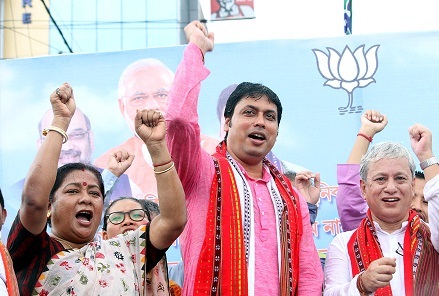 Tripura Chief Minister Biplab Kumar Deb on Tuesday left for Mizoram to campaign for the Bharatiya Janata Party (BJP) in the run-up to the November 28 Assembly elections in the neighbouring state. Deb was followed by state minister Santana Chakma and BJP legislators Shambhulal Chakma and Pramod Reang who have also left for Mizoram to campaign for ensuing Assembly elections in that State. The BJP is leaving no stone unturned to make inroads into Mizoram and it is the only state in the North-east where the saffron party has no presence. The presence of Santana Chakma, Shambhulal Chakma and Pramod Reang assumes significance as in the 40-member Mizoram state assembly, there are at least five seats which are dominated by Reang and Chakma community voters. The BJP leaders from Tripura, including the Chief Minister will try to grab all these five seats from Congress. Four of the five seats are located in the southwestern part of Mizoram bordering Tripura and dominated by the Reang or the Bru tribal voters who constitute the second largest tribal population in the State. Besides, Chakmas dominate at least one Assembly seat encompassing their ADC areas in Chhimtuipui district. Tripura Chief Minister Biplab Kumar Deb is scheduled to address a mass rally along with Santana Chakma and Shambhu Lal Chakma on Wednesday in Kamalanagar, the headquarter of the Chakma district council. The rally will also be addressed by BJP national general secretary Ram Madhav and northeastern organizational in charge Ajay Jambwal. Notably, Tripura BJP general secretary Pratima Bhowmik is already camping in Mizoram.